New York City is an amazing place to live for someone devoted to healthy, clean, plant based eating. I am so lucky to be surrounded by many options for pressed juice, smoothies, raw food, plant based meals, and farm to table fine dining. I am constantly discovering new places to add to my list of favorites! Recently, a girlfriend introduced me to Hu Kitchen, which has quickly become my newest obsession. Hu Kitchen is an eat in/take out mecca of my favorite kinds of food. They have a great juice and smoothie bar (I love to add kale to the Smooth Avocado for a nutrient dense liquid lunch), delicious prepared foods, and best of all a "mashbar." The "mashbar," is a clean eater's version of the frozen yogurt or sundae bar. 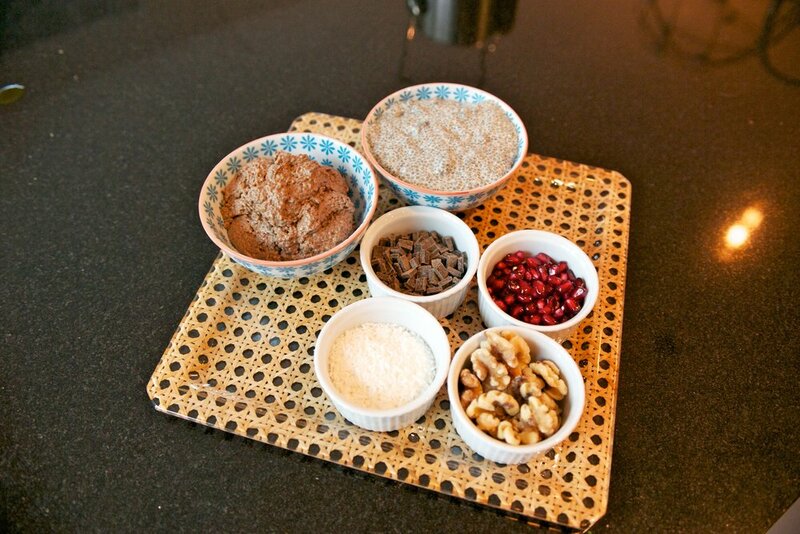 You start with a base such as their divine chocolate chia pudding and add toppings from there. So far my favorite combination is chocolate and vanilla chia pudding with strawberries and coconut cream. I fully admit to getting two per visit so I can have multiple nights worth of dessert in my fridge! This stuff is beyond amazing. I desperately want them to open in TriBeCa ( hint hint). Sadly I cannot visit Hu Kitchen every day. So, with their "mashbar" as my inspiration I decided to make my own at home Chia Pudding Bar. I have been enjoying chocolate and vanilla chia pudding at home for years, but never thought to add multiple toppings into the mix. Chia pudding lasts a few days in the fridge so I like to make batch of each flavor and then top with whatever I have on hand when the mood hits! It has been tiding me over until I can get back to Hu Kitchen. Today is also my niece and nephew's 1st Birthday! Happy Birthday Ben and Grace! They are not quite eating desserts yet, but how much fun would a Chia Pudding Bar be at a kid's birthday party? Much better than a sundae bar in my opinion. Maybe next year their aunt will set one up at their party! Or take them to Hu Kitchen? Or both? Combine coconut milk, cocoa powder, vanilla and stevia in blender. You could also do this by hand but cocoa powder can be hard to incorporate evenly in liquid so a blender works best. Pour blended coconut milk over chia seeds and stir. Allow chia pudding to sit in refrigerator for 30 minutes to an hour stirring occasionally until it thickens and the chia seeds absorb all of the liquid. Combine all ingredients in a medium bowl. Taste and adjust sweetness and vanilla flavor to your liking.